DJI takes on GoPro with DJI OSMO Pocket – a 4K/60p 3-Axis Gimbal Stabilized Camera! Just in time for the Christmas holiday shopping season DJI announced the DJI Osmo Pocket, a tiny 3-axis gimbal stabilized camera that can record 4K/60p video. Some of you may recall a few months back there were rumours of DJI possibly working on an action camera to go head-to-head with the GoPro Hero7 Black, and looks like the DJI OSMO Pocket may be that very device in question. 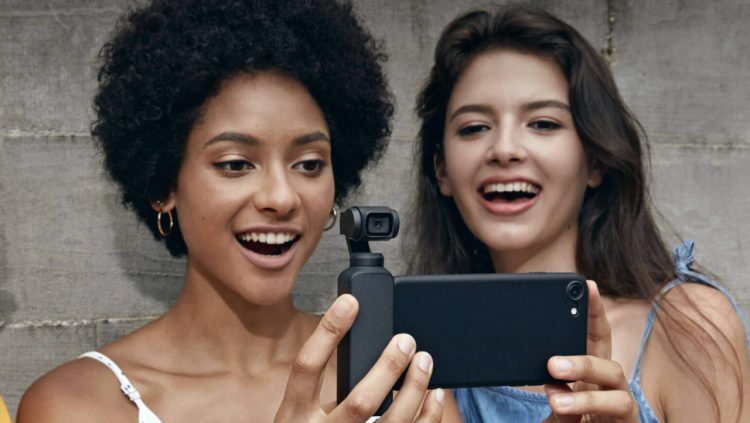 Designed to be incredibly easy to use, just like your classic GoPro action camera, the DJI Osmo Pocket offers 3-axis gimbal stabilization, which rivals (and from the promo video it looks even better than) GoPro’s HyperSmooth EIS, but that is subject to testing of course, and a host of intelligent features to help capture creative videos and photographs in a portable form factor. At just over 4 inches tall, Osmo Pocket is DJI’s smallest three-axis stabilized camera with a 1/2.3-inch sensor records 12-megapixel photographs and 4K video up to 60fps at 100Mbps. 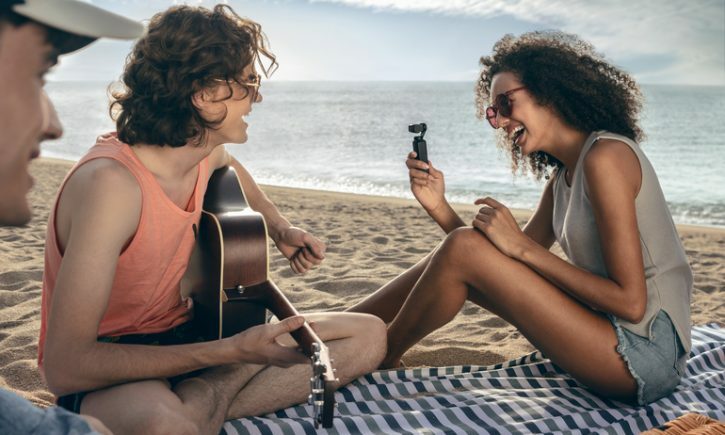 The DJI Osmo Pocket also uses built-in dual microphones and advanced noise-canceling algorithms to ensure you capture high quality audio to match your footage. Furthermore, a battery life of up to two hours shooting video in 4K, 30fps means you can always rely on Osmo Pocket to capture your story no matter where you are at the very best quality. Building on DJI’s industry-leading experience with gimbal stabilization technology, the DJI Osmo Pocket seeks to establish a competitive advantage over the competition thanks to DJI’s state-of-the-art three-axis mechanical gimbal, which compensates for movements and smooths these motions so you can focus on composition and subject matter. takes ActiveTrack one step further. automatically recognizes a human face and locks the subject in center of the frame at all times. It does not identify individual faces, but keeps the camera centered on one. To initiate FaceTrack, simply select selfie mode and the camera will detect your face. Instead of locking the gimbal to maintain the horizon, FPV tells the camera to follow your every tilt and lean. 3 x 3 takes an expansive 9 images in total while 180° mode captures 4 images. Osmo Pocket software stitches them together automatically so you can focus on the framing of the scene. Bring creative editing to your video with a host of preset music, video transitions and colours. Choose one of 10 fun templates and Mimo will handle the camera movement for you. After finishing, Mimo automatically generates your very own short story, ready to be shared. automatically detects and illuminates low-lit scenes into bright photos. makes the Osmo Pocket compatible with action camera accessories for a helmet, backpack or your wrist. Specifically designed for Osmo Pocket, ND filters attach to the front of the camera to reduce the amount of light entering the sensor. the Waterproof Case which can be placed at a depth of 60 meters. The Extension Rod attaches to the Lightning or USB-C port and provides 31 inches of reach to Osmo Pocket, opening a world of new creative angles that are normally difficult or impossible to get. This dual-purpose case not only protects Osmo Pocket while in transit but charges it as well. Dedicated sections were added into the case for your MicroSD card and ND filters so you can quickly grab your Osmo Pocket and know you’re ready to capture those moments and adventures. allows you to connect an external microphone if you prefer to capture audio using a separate device. 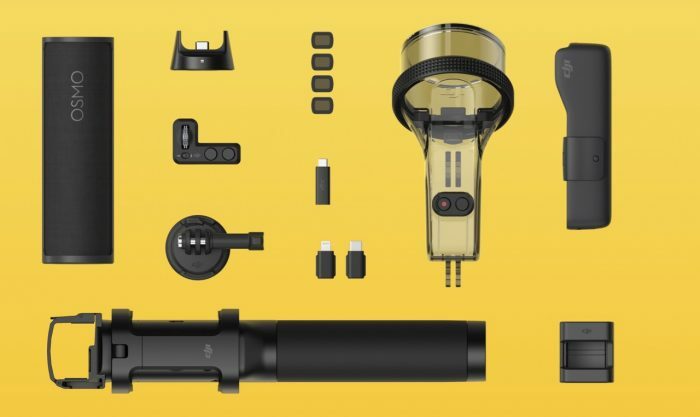 The DJI Osmo Pocket retails for $349 USD and will be available for pre-order at store.dji.com and authorized Retailers such as B&H, Adorama, and additional retailers starting today. Pre-orders will start shipping on December 15th. For more information on all the new features and capabilities of Osmo Pocket, please visit www.dji.com/osmo-pocket.